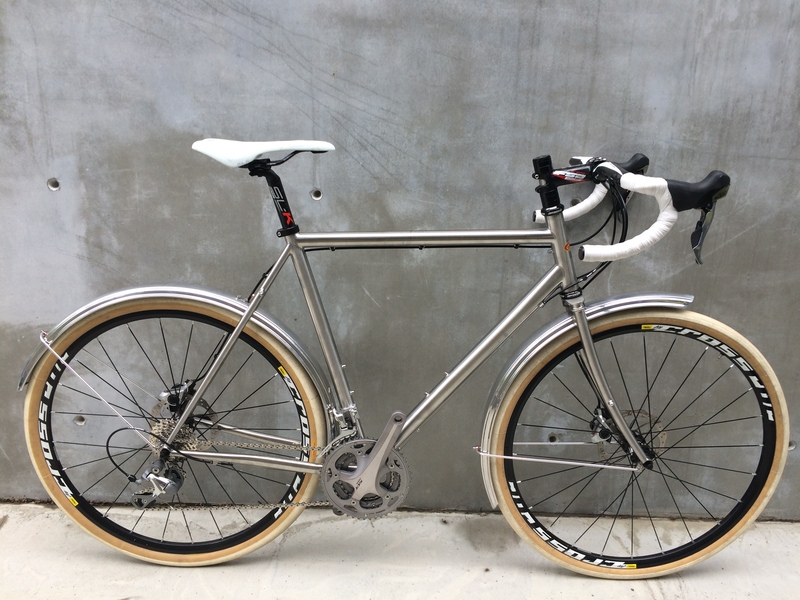 This entry was posted in Custom Build, News, Progress and tagged 650b, 650B Randonneur Bicycle, 650b Touring Bicycle, Custom Bicycle Builds, Stainless Steel Bicycle Frame by Evan. Bookmark the permalink. 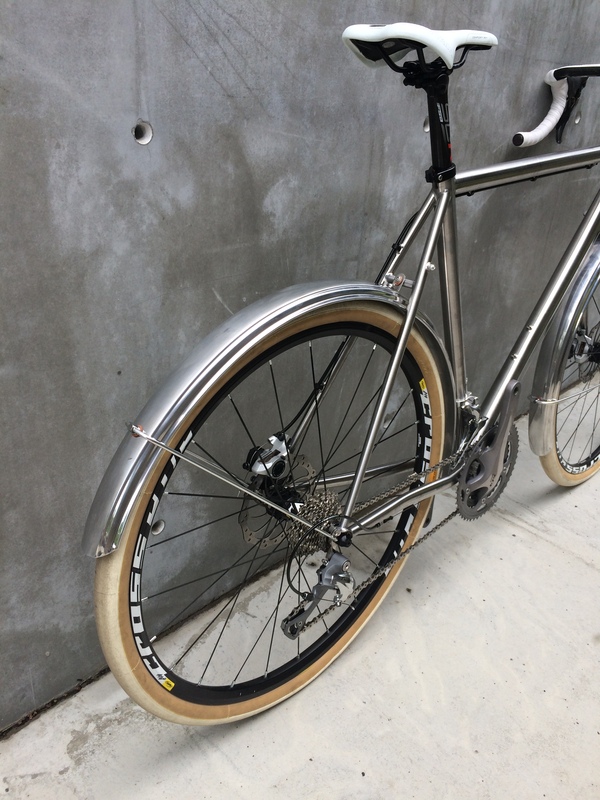 I’d buy a rim brake version of this, specifically one with centre-pull braze-ons. I guess I could just put them on myself, dunno if anyone is making a stainless steel version. The disc option makes way more sense with the amount of MTB wheelsets in 650b these days so I understand the choice. Pump peg and all the other braze-ons are very nice to have. I also like the slightly brushed finished. I’m late to the party (it’s now nearly 6 months since you posted this), but I LOVE it! 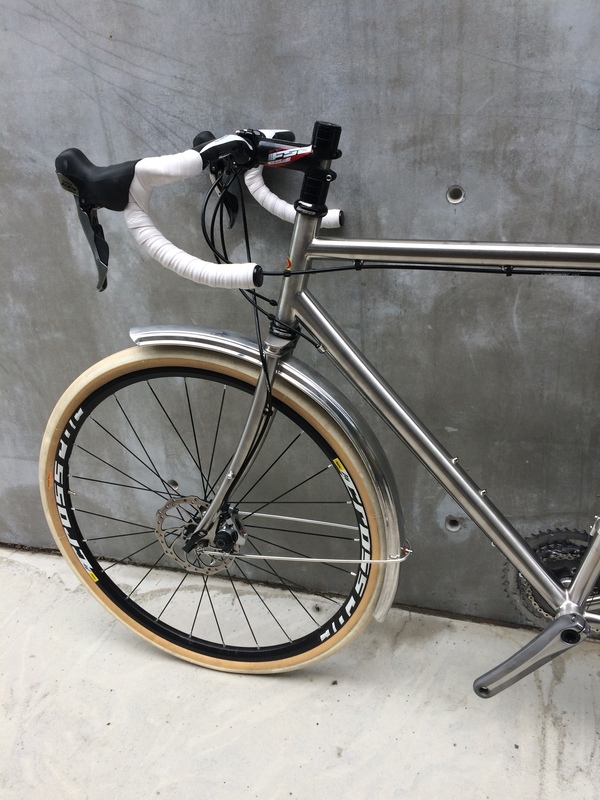 Would a frameset like this work with the 26″ Compass Rat Trap Pass tire and fenders? I hope so! What’s the appeal of the SS tubing? A lot of folks buying this type of bike like flexible, lighweight standard diameter 4130, so OS or double OS, even with this butting profile will be on the stiffer end of the spectrum. Where would a bike like this be made? 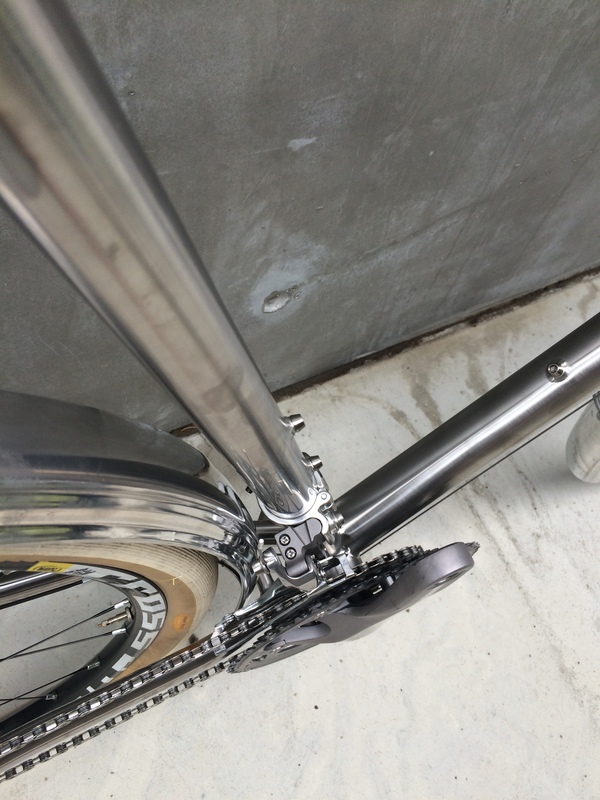 $2000 for a frameset is already in custom bike territory, but I know SS is expensive and hard to work with. Any chance of doing a low, tight fork bend with standard chromoly and disc brakes like Alex Wetmore’s travel Gifford? Sorry for the slow follow up Daniel. Angus and I just got back from the Taiwan and gave our feedback on our prototypes to our engineer. The long and short is the 26″ wheels with Compass Rat Trap Pass tires should work but need brakes with a very long reach of about 80mm (the Diacompe &50 that we stock only reach 75mm). The SS tubing has a higher 1300MPa tensile strength vs 760 MPa for our 4130 Cro-mo VR which lightens the frame between about 250-300g and is corrosion resistant. We are considering a Cro-Mo VR V3 for 2017/2018 that would be for disk brakes. I got to ride the other prototype at PT Cyclery in Port Townsend, WA this past Saturday. Man what a bike. I noticed the seat stays have a different shape then the one pictured here. All I can say is this was the first time I felt inspired and confident on a bike the first time out. It felt so solid and bombproof. That says a lot because I am what you call a super Clydesdale. Meaning I am 6’2″ and 270lbs for one. (That is solid.) Also I ride year round on and off road pushing my bikes to their limits. This bike brought back some great memories of rides I had on my old Ralaigh Gran Prix. After I had put over a 100,000 miles on it as a used bike it finally wore out. The frame still hangs in my garage. Do you have a price for this bike yet? Better yet do you need a tester? There is a huge section of us big guys who would love a durable no nonsense bike. I would love to ride it and give it the Clydesdale Tough seal of approval. Please let me know and again what a great bike. Thanks for the feedback. Which prototype did you ride, the 650b VR or 700c All-Road Pave or both? Our goal is make a frame that very durable, reasonably lightweight all things considered and all with a compliant ride. 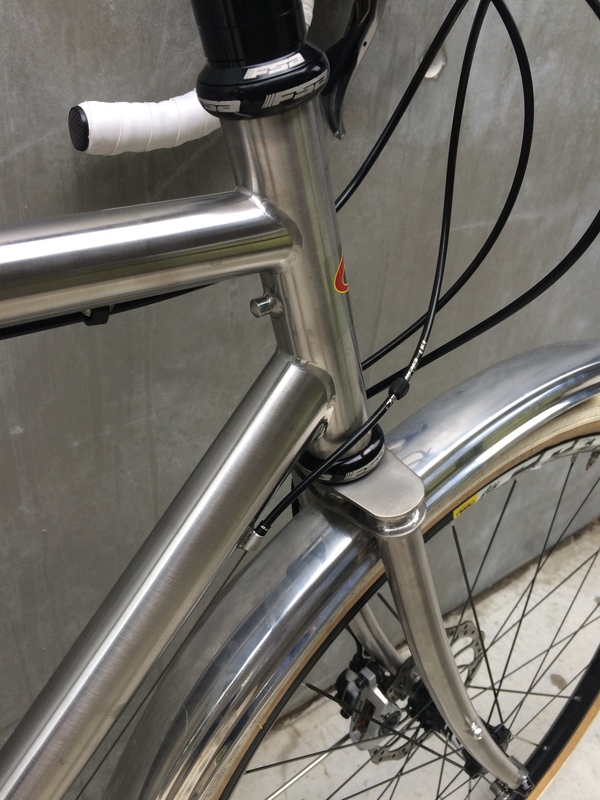 The feedback received has been positive for the first two attributes but that frame and the rear end in particular is too stiff and could be more compliant. We are working a revised 2nd set of prototypes with lighter seat stays and slightly reduced top and down-tube diameters. We will report on them as soon as we finalize the details. As such, we are pushing off production to late 2016 / early 2017 with a pre-order deal of 20% off based on a $200 USD deposit. It was the Pave and I like the stiffness in the rear. Again being a big guy we like sitting on a bike that does not feel like it would bend or break.